US, 1953, 77 minutes, Black and white. Robert Ryan, Jan Sterling, Brian Keith, Gene Barry. 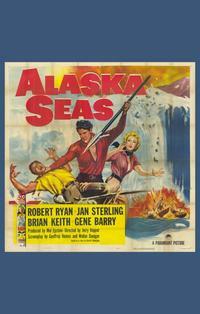 Alaska Seas is one of the many small budget but well made action adventures of the 1950s. They were B-grade in budget, often served as a support in the days before television. They stand up quite well as brief action entertainments. Director Jerry Hopper made many of these and with such standard casts as Robert Ryan and Brian Keith and Gene Barry. The film was a brief remake of the Henry Hathaway 1938 adventure Spawn of the North with Henry Fonda and Dorothy Lamour. 1. How entertaining a film? Adventure? A B-grade film ? its quality and success? 2. The brevity of the B-film? Adventure conventions? Better than usual, average? 3. Black and white photography? Alaska settings? Music? Special effects, especially on the sea, the final avalanches? 4. The basic credibility of the plot? Alaska in the early 20th. century? The types of characters there and their work, difficulties, betrayal? 5. The delineation of the principal characters? The good hero, the likable villain, the hardhearted businessman and calculating villain, the rugged heroine? The qualities, strengths and weaknesses? 6. The pioneering atmosphere? The fishing, the canneries, the rivalries? 7. The use of the triangle, truth, lies? The man who seems to be born bad, betrays, assumes that what he does is right, redeem himself eventually? 9. Themes of economics, greed? 10. The portrayal of rugged American masculinity? 11. Conventional portrayal of themes of good and evil? Human nature?